As soon as I walked into this gorgeous church - St. Paul's Basilica in Toronto - I noticed a steam of light coming in in the centre isle. 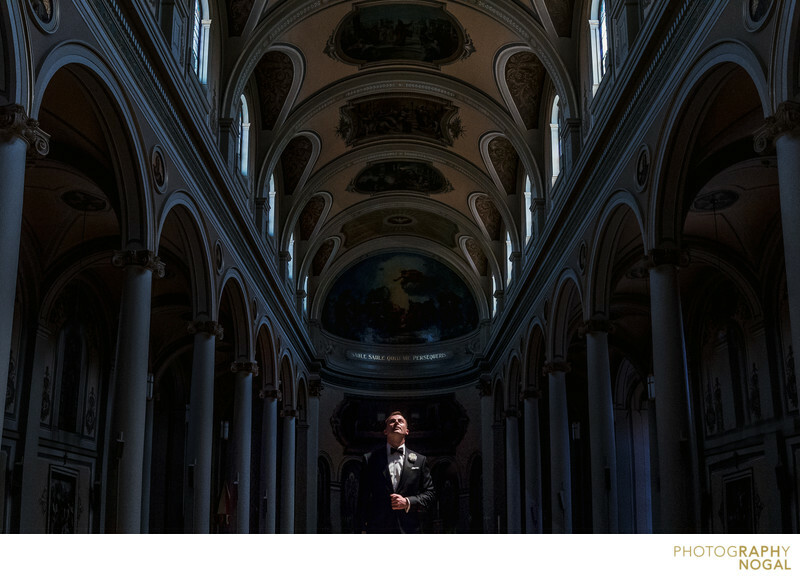 I quickly grabbed the Groom and asked him to look up in a moment of reflection. The light warm light contrasted nicely with the blueish background to help bing impact to this image. This image was taken with a Nikon D750 at ISO2500, f5 aperture, 1/125th of a second shutter speed. Lighting was provided by sunlight streaming in through a stained glass window. Location: 83 Power St, Toronto, ON M5A 3A8.